In the Feature Room at Galerie m, a singular video work is being shown that was created in 2014 by the Berlin-based artist Jan Wawrzyniak (b. 1971), previously represented in Bochum chiefly by his “Drawn pictures.” The video “Drawn by the other” documents the process of drawing an 18-meter-long line (“Alexander line”) on Shoji paper, the final drawing destined for the exhibition “Broken and Lost Drawing” at the Museum Wiesbaden in 2014/15 and since that time part of the museum’s collection. The artist reflects in this work on fundamental questions arising in the tension between artistic production and its embedding in certain social relations while he also raises elementary issues with respect to the process of drawing itself. For what could be more immediate and essential when it comes to drawing than executing a single line? Jan Wawrzyniak approaches this question in his own unconventional way. 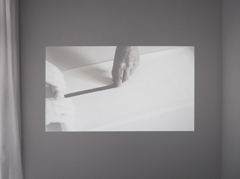 The artist’s hand holding a piece of charcoal hesitates at the center of the projection. “The line emerges from the point that the hand has chosen. 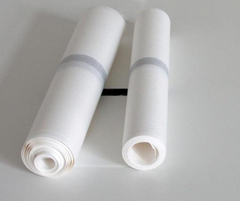 The hand dots the paper and, while the paper moves, the hand remains passive. The line is not drawn, it is anticipated.” This statement by the artist, as well as the title of the video work, “Drawn by the other,” with its double meaning, can be read as references to the complex contexts that resonate in this work – for all the simplicity of the form. Wawrzyniak shifts the traditional role of the artist as an actor giving shape to form into a reciprocal relationship in which form takes shape. The line realized by pulling the paper appears here not as the result of a gestural action but through social interaction based on mutual dependence and trust. At the same time, this division of labor draws our attention to two essential elements of drawing a line: the pressure and the movement. The line harbors within itself its own process of generation, showing the traces of the drawing and hesitating hand, with small breaks that document the transition between pause and movement. Not much is to be seen in the video, only the rhythmic flow of the process, which has neither beginning nor end: an ongoing “give-and-take from hand to hand” (Ulrike Kregel). Tense “drawing of breath” alternates with concentrated action. The scratching of the charcoal on the paper, the pulling of the paper, and the sound of rolling back and forth form the beat of this work. “The simplicity of the form is a consequence of the reduced number of decisions,” as Wawrzyniak puts it. 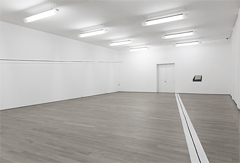 While for the exhibition set-up in Wiesbaden the realized lines were the focus, the video work concentrates directly on human interaction as the actual challenge.